German football didn’t turn professional until the mid-sixties, but by that time the (West Germany) national team had already won the World Cup, and one of their clubs had reached the final of the European Champions Cup. That club was Eintracht Frankfurt, whose appearance is etched in the memory of a generation of British football fans. The club had the misfortune to appear in the 1960 final in Glasgow in front of a crowd of more than 127,000, which was televised live and sent shock-waves throughout the land. Real Madrid won their fifth consecutive title that day – they were the sole winners of the cup at that point – and their 7-3 demolition of a decent Frankfurt side was probably the club’s greatest hour. By spring 1974, however, things had changed dramatically. The West German national side were reigning European champions and would become World Champions during the summer. The Bundesliga was now a major force in European football and Bayern Munich were poised to usurp Ajax as the continent’s preeminent club. Their three consecutive European Cups would match the Dutch masters’ achievement over the previous three years, and Bayern skipper Franz Beckenbauer would become Der Kaiser of not just his country, but international football. 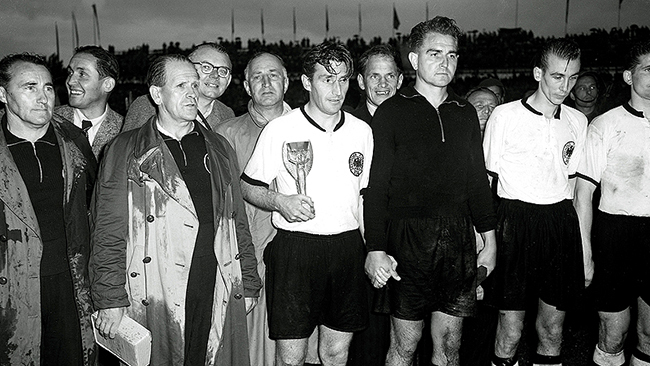 Bayern’s – and Germany’s – first triumph in the Champions Cup was performed in two acts. The first was a 1-1 draw against Atlético Madrid at the Heysel stadium in Brussels on 15 May, with both goals coming right at the end of extra time – Bayern’s with just one minute left to play. The replay took place three days later, in front of a mere 23,000 fans in the same stadium (which would itself achieve an unwanted place in football history the following decade). This time the Germans won emphatically 4-0, with two superb goals each for the legendary Uli Hoeness and Gerd Müller. Bayern’s next victory came against Leeds United in France the following year, and the game is notorious for two things: controversial refereeing decisions, and the Leeds supporters’ reaction to them. A Bayern player was taken off after what their coach described as “the most brutal foul I think I have ever seen” and Frank Gray later half-crippled Uli Hoeness. Leeds were denied two penalties, one of which looked ‘nailed-on’ or ‘stonewall’ depending on your preference. The straw that broke the camel’s back was the referee’s awarding of a Peter Lorimer goal, only to reverse his decision after Beckenbauer persuaded him to consult the linesman. This triggered rioting among the Leeds fans and the match was delayed. Bayern scored after play resumed, and added another ten minutes later to win 2-0. Leeds were banned from Europe, which proved academic as they went into sharp decline from that day. Bayern matched Ajax’s three in a row with a 1-0 win over the flamboyant and unlucky Saint-Étienne in Glasgow. Müller scored for the third consecutive final and the French players wept at the final whistle. West Germany had to wait two decades for the next success, when Hamburg beat Italian giants (but perennial European under-achievers) Juventus in 1983. Before a 75,000 crowd in Athens the Germans overcame a star-studded Italian side that included six members of the 1982 World Cup winning team, plus legends such as Michel Platini and Zbigniew Boniek. By 1997 the Champions Cup was the Champions League, and Juventus were the victims once more as Borussia Dortmund (having beaten Manchester United home and away in the semi-final and including current Aston Villa manager Paul Lambert) beat a Juve team including Zinedine Zidane – and beat them soundly 3-1. At the home of Bayern Munich. Which was nice. Bayern got their hands on the cup again in 2001, and are currently the fourth most successful club in the history of the competition, having been winners four times and runners-up five times prior to Saturday’s final at Wembley. They drew 1-1 with Valencia after extra time and won 5-4 on penalties.